This time of year always warms my heart and reminds me of many wonderful holidays spent with family and friends. But, I’ve found that if I’m not careful, I can find myself getting wrapped up in the busyness of the season, things to do, people to see and gifts to buy. I think this is true for most people. Many people live life “maxed out” before the holiday season even starts, and then adding just a little extra stress on top creates a recipe for frustration, hurt feelings and strife. The Bible warns us in James 3:16 that when strife comes in, it opens the door for “every evil work.” We have to close the door on strife and use wisdom when planning our days. We have to consciously make the effort to receive God’s grace, extend mercy to others, and hold on to peace. Grace is God’s supernatural favor, mercy and empowerment upon you. It’s His ability working in you to accomplish what you need to. When Jesus left the earth, He said, “I may be going away, but I’m sending One who will never leave you—the Holy Spirit will reside in you and teach you all things.” When you align yourself with the Spirit of God, you will be equipped for every good work by His grace. His grace will empower you to love others and help you navigate the holiday season! When you receive God’s grace, it empowers you to extend mercy. Choosing mercy means choosing victory because mercy triumphs over judgment! That’s why Jesus showed mercy everywhere He went. Scripture tells us that Peter, one of Jesus’ disciples, denied Him three times after He was arrested to be crucified. Do you know how Jesus responded? When He rose from the dead, He appeared to Mary at the tomb and said, “Tell everyone that I’ve risen…and go find Peter!” Jesus singled Peter out because He wanted him to know that he was still loved, valued and forgiven. Jesus didn’t hold a grudge. Instead, He extended mercy to Peter and restored him. He extends that same mercy to us every day, and we can extend it to others this holiday season! Maybe the holidays don’t bring back good memories for you. Maybe you’ve been hurt, denied or rejected by someone. Maybe you are working through some pain right now. Remember, Jesus gave us an example of mercy, and He has equipped us by His grace to overcome. It’s easy to take offense. It’s easy to hold on to the hurt and pain of the past. But the best way to move forward is to give all that pain to God and let Him heal you. Receive His grace so that you can show mercy this holiday season and every day of the year! Deuteronomy 28:4 – “Blessed shall be the fruit of your body, the produce of your ground and the increase of your herds, the increase of your cattle and the offspring of your flocks. Would you want to buy a chair that Jesus made? I would, even if it cost US$1,000 because it would be of superb quality. Whatever Jesus did, He did it with perfect excellence. And because Christ is in you, the things which you produce will be of exceptional quality too. That includes your children, who will be champions. Deuteronomy 28:4 says, “Blessed shall be the fruit of your body, the produce of your ground and the increase of your herds, the increase of your cattle and the offspring of your flocks”. God was using terms that the Israelites understood since they were farmers and shepherds. Today, “your ground” is the place of your work. This means that “the produce” of your work shall be of excellent quality. That is not all. God promises that quantity will always follow quality because Deuteronomy 28:11 says that the Lord will “grant you plenty of goods, in the fruit of your body,” which means that you will have plenty of children, “in the increase of your livestock, and in the produce of your ground,” which means that your business will flourish and you will be a leading producer in the area of your specialty. Jesus was made destitute of all material things at the cross. He had nothing! As He hung on the cross, He watched the Roman soldiers gamble for His robe. His last possession on earth was gambled away. He became poor, so that you could be blessed with the excellent and the plenty! Jesus was made destitute of all material things at the cross, so that you could be blessed with the excellent and the plenty! (2) Don’t give in to short–term thinking. Look at Jesus, ‘Because of the joy awaiting Him, He endured the cross.’ (Hebrews 12:2 NLT) Keep your eye on the finish line. You don’t get the trophy until the race is over, so make up your mind to ‘stay the course’ and finish strong. (3) Start praying the right way. When you understand that God’s objective is to make you more like Christ, you’ll start praying fewer ‘comfort me’ prayers and more ‘conform me’ ones. Instead of asking, ‘Why me, Lord?’ you’ll ask, ‘What do You want me to learn, Lord?’ James writes, ‘Let the process go on until…you have become men [and women] of mature character.’ (James 1:4 PHPS) That’s how you become more Christ–like. I declare that I am special in Jesus’ eyes, and He loves me unconditionally. I have an awesome destiny. Jesus has equipped me with gifts, talents and abilities. Today, I receive the abundance of grace and the gift of righteousness to reign in life. I give thanks that His favor surrounds me like a shield and opens doors of opportunities for me. Because of Jesus, I shall be the head and not the tail, above and not beneath, the lender and not the borrower. I shall not suffer lack but be surrounded by His abundance, His wisdom, His peace and His protection. Thank You, Jesus, for Your finished work at the cross for me. I receive a fresh revelation of Your love right now and thank You that everything my hands touch shall be blessed! I believe with all my heart that I am greatly blessed, highly favored and deeply loved! Amen! God’s promises are eternal, and what He has said in His Word cannot be altered in any way (Psalm 119:89). That means that every good thing He has promised you, MUST come to pass! This entry was posted in WALTER'S WEB and tagged CHOOSE, christianity, FAITH, FULL GOSPEL, GIFTS OF THE SPIRIT, HEALING, HOLY SPIRIT, JESUS CHRIST, MIRACLES, PROSPERITY, VICTORY, VICTORY MINISTRIES, WALTER KAMBULOW, WORD OF FAITH on November 30, 2014 by WALTHOPE. Romans 8:32 He who did not spare His own Son, but delivered Him up for us all, how shall He not with Him also freely give us all things? 1 Corinthians 2:12 Now we have received, not the spirit of the world, but the Spirit who is from God, that we might know the things that have been freely given to us by God. Matthew 10:8 Heal the sick, cleanse the lepers, raise the dead, cast out demons. Freely you have received, freely give. This entry was posted in WALTER'S WEB and tagged ALL THINGS, christianity, MIRACLES, WORD OF FAITH on November 30, 2014 by WALTHOPE. Psalms 34:10 The young lions lack and suffer hunger; But those who seek the LORD shall not lack any good thing. The word of God promises that those who seek the LORD shall not lack any good thing, be it spiritual, physical, financial or social! Yet we live amongst people including Christians who lack all kinds of things! Now this doesn’t make sense at all and is contrary to the word of God! And then we have those Christians who say they are going through a great trial and are suffering like Job did with the loss of everything! But Job came out of his trial and God restored to Job double all his losses! So how come this is not happening to Christians today that God is not restoring double their losses when God’s word say His will is prosperity? 3 John 1:2 Beloved, I pray that you may prosper in all things and be in health, just as your soul prospers. 3 For I rejoiced greatly when brethren came and testified of the truth that is in you, just as you walk in the truth. 4 I have no greater joy than to hear that my children walk in truth. This entry was posted in WALTER'S WEB and tagged christianity, FAITH, FALSE PROPHETS, FULL GOSPEL, GIFTS OF THE SPIRIT, HEALING, HOLY SPIRIT, JESUS CHRIST, MIRACLES, PROSPERITY, SHALL NOT LACK, VICTORY, VICTORY MINISTRIES, WALTER KAMBULOW, WORD OF FAITH on November 30, 2014 by WALTHOPE. A testimony is often a way of sharing what God has done in a person’s life. However, in order to have a testimony there almost always was a test through which that person had to persevere. It is, therefore, understandable that we are told to rejoice during trials — not because of the trials themselves, but because of the end result of the trials. In James 1:2-4, we are told, Consider it pure joy, my brothers, whenever you face trials of many kinds, because you know that the testing of your faith develops perseverance. Perseverance must finish its work so that you may be mature and complete, not lacking anything. In other words, we can have joy during trials, because we know that they help make us mature and complete — they refine us into the person God wants us to be. A few verses later (in James 1:12), we are told the reward of enduring difficult times: Blessed is the man who perseveres under trial, because when he has stood the test, he will receive the crown of life that God has promised to those who love him. The challenging events that we go through are what refine us and make us more like Christ. Indeed, 1 Peter 1:6-7 says that one of the purposes of going through grief and trials is so that our faith can grow and be proven genuine. Therefore, a real testimony of growing in faith and becoming like Christ requires going through a test. So, instead of despising your tests and trials, look forward to your testimony; after all, you can’t have a testimony without a test. Not only does Jesus’ refusal to defend Himself show His humility, but His refraining from venting His wrath against the man who senselessly killed His friend who was the greatest of the Old Testament prophets (Mt. 11:11), also displays His humble nature. Because of Christ’s humility and obedience to the Father, God gave Him a name that is above every name in heaven, earth and under the earth. There is no exemption for anyone or anything from coming under the Lordship of Jesus. He is Lord of ALL. Jesus has not only been exalted above every “being” that has a name, but He is also highly exalted above anything else that can be named. If you can put a name on it, Jesus is above it. Sickness, poverty, depression, anger – everything has to bow its knee to the Lordship of Jesus. Every knee of men, angels, and demons will bow and confess that Jesus is Lord. Those who have denied His existence will bow in worship. Those who have spent their lives rebelling His authority will finally bow in submission. Every being from all ages will ultimately bow and worship Jesus. If we bow our knee to His Lordship now, we will enjoy a wonderful life here on earth, and an eternity in His blessings hereafter. Those who deny His rightful claim to the Lordship of their lives will suffer for it in this life as well as in the next. They still will have to bow their knee to His authority, so there is nothing to gain and everything to lose if they refuse to make Jesus Lord of their life. In its “plot,” the story of the Bible ends up very much where it began. The broken relationship between God and human beings has healed over at last, and the curse of Genesis 3 is lifted. Borrowing images from Eden, Revelation pictures a river and a tree of life (Rev. 22:1-2). But this time a great city replaces the garden setting—a city filled with worshipers of God. No death or sadness will ever darken that scene. When we awake in the new heaven and new earth, we will have at last a happy ending. For people who feel trapped in pain or in a broken home, in economic misery or in fear—for all of us—heaven promises a timeless future of health and wholeness and pleasure and peace. The Bible begins with the promise of a Redeemer in the book of Genesis (3:15) and ends with that same promise (Rev. 21:1-7)—a guarantee of future reality. The end will be the beginning. Sweet rest in Jesus, O blest reward! A lady flew across the country to tell a talk show host how her husband had left her for another woman. The lady, who was young, vibrant and beautiful, pulled out a photograph and said, ‘Just look at her. He left me for that!’ The host concluded, ‘Sadly, we’ve been conditioned to think that “looks” are all–important, when, in fact, they’re not.’ Nevertheless we keep measuring, comparing, and beating ourselves up because we fall short. If you can’t enjoy who you are because of what you’re not, you’ll never be happy. Advertisers spend billions getting us to decorate a shell that’s in a losing battle with Mother Nature and Father Time—all in an effort to create what we think will attract others. And when it doesn’t work, we get depressed and wonder what went wrong. Of course, it’s important to look your best but, when you’re obsessed with your appearance, you become superficial. And others lose respect for you because they discover that although the box is beautifully wrapped, it’s empty. If you want to know what ultimately wins hearts and attracts the right people, read these words: ‘I pray that from His glorious, unlimited resources He will empower you with inner strength through His Spirit. Then Christ will make His home in your hearts as you trust in Him. Your roots will grow down into God’s love…And may you have the power to understand…how long, how high, and how deep His love [for you] is…Then you will be made complete.’ (Ephesians 3:16–19 NLT)That’s the secret to inner beauty! This entry was posted in WALTER'S WEB and tagged A TEST, christianity, FAITH, FULL GOSPEL, GIFTS OF THE SPIRIT, HEALING, HOLY SPIRIT, JESUS CHRIST, VICTORY, WALTER KAMBULOW, WORD OF FAITH on November 29, 2014 by WALTHOPE. If it matters to you, it matters to Him! No care is too small to bring to your heavenly Father. God has provided everything we need in this life & in the life to come—forgiveness of sins, healing, victory, deliverance, & prosperity. God is so good! Beloved, our God is a BIG God of abundance and inexhaustible supply. He is the Possessor of heaven and earth. He is El Shaddai—the Almighty, all-sufficient and all-nourishing one! And in Christ, the abundance of God’s wisdom, wealth, riches, power, favor, ability, strength and creativity that you need for a successful family, career and ministry, are yours to experience and enjoy as per Philippians 4::19 And my God shall supply all your need according to His riches in glory by Christ Jesus. Luke 18 27 But He said, “The things which are impossible with men are possible with God. Beloved, everyone who came to Jesus sick left completely healed. Our Lord Jesus is the same yesterday, today and forever. Come receive your miracle! 2) BE AN ENEMY TO THEIR ENEMIES – Exodus 23:22 But if you indeed obey His voice and do all that I speak, then I will be an enemy to your enemies and an adversary to your adversaries. 4) MEET AND SUPPLY ALL THEIR NEEDS – Philippians 4:19 And my God shall supply all your need according to His riches in glory by Christ Jesus. 5) GIVE THEM VICTORY – 1 Corinthians 15:57 But thanks be to God, who gives us the victory through our Lord Jesus Christ. 6) HANDLE ANY PROBLEM GIVEN TO HIM – Psalms 55:22 Cast your burden on the LORD, And He shall sustain you; He shall never permit the righteous to be moved. This entry was posted in WALTER'S WEB and tagged christianity, FAITH, FULL GOSPEL, GIFTS OF THE SPIRIT, HOLY SPIRIT, JESUS CHRIST, VICTORY, VICTORY MINISTRIES, WALTER KAMBULOW, WORD OF FAITH on November 28, 2014 by WALTHOPE. This entry was posted in WALTER'S WEB and tagged christianity, FAITH, FULL GOSPEL, GIFTS OF THE SPIRIT, HOLY SPIRIT, JESUS CHRIST, PLENTY, VICTORY, VICTORY MINISTRIES, WALTER KAMBULOW, WORD OF FAITH on November 28, 2014 by WALTHOPE. CREATION CAN’T BUT REDEMPTION CAN! John 9:7 – And He said to him, “Go, wash in the pool of Siloam” (which is translated, Sent).So he went and washed, and came back seeing. When Adam sinned and fell, everything about creation fell. Yet, people today are still putting their trust in creation. For example, they try to become healthy by eating what is called the “Eden diet”—vegetables and no meat. They are acting as if creation did not fall. They also forget that there are people who eat well and exercise regularly, and still drop dead in the prime of their lives! Thank God that what creation cannot do, redemption can and did. Jesus demonstrated this when He spat on the ground, made clay with the saliva and put it on a blind man’s eyes. (John 9:6–7) Now, it is certainly unusual to put clay on a blind man’s eyes because he would become doubly blind! So why did Jesus do that? He was demonstrating to us that all our body parts come from the ground and that because creation is fallen, the work of creation cannot open a blind man’s eyes. But the work of redemption can! That is why He sent the blind man to the pool of Siloam. The word “Siloam” means “Sent”, referring to the sent one, Jesus. When the blind man washed his eyes in the pool of the sent one, he received supernatural healing for his eyes. Beloved, when we go to Jesus, the sent one who came to redeem us with the price of His blood, and we rest in His finished work, we will receive the miracle we need. If we believe that by His stripes we are healed (Isaiah 53:5), we will have greater health than those who trust in creation. Jesus was sent to redeem us from every curse that came upon creation with the fall of Adam. (Galatians 3:13) He has redeemed us from sickness, pain, sorrow, depression, poverty and even death. The world may know Him as the Creator. But today, we know Him as our Redeemer. Where the work of creation cannot save us, His work of redemption can and has! Where the work of creation cannot save us, Jesus’ work of redemption can and has! GOD meets us at the level of our faith. Ordinary prayer gets ordinary results. Extraordinary prayer gets extraordinary results. “The Lord said to Gideon,the people who are with you are too many…lest Israel claim glory for itself.” Judges 7:2. God reduced Gideon’s army from 32000 men to 300 men! Jesus is your victory & all glory belongs to Jesus alone! (1) People who influence you to be the person God intended. ‘As iron sharpens iron, friends sharpen the minds of each other.’ (Proverbs 27:17 CEV) Relationships are the tools God uses to do this. When you’re with somebody, ask yourself, ‘Do I like who I am when I’m around this person? Am I more open, loving and honest? Or do I not like what I see in myself?’ Choose people who make you a better person. (2) People who provide grace for the energy drain. When you’re empty you need to be refuelled physically, spiritually and relationally. So surround yourself with friends who will listen, encourage and be there for you. (3) People who let you be real. ‘A friend loves at all times.’ (Proverbs 17:17 NKJV) The best relationships are those where you know you’re loved, you’re free to be yourself, you don’t have to put on an act and you can be honest about the difficult aspects of life. There’s comfort and normality in friendships where you can be authentic. (4) People who help you grow in faith. You need friends who encourage you to pray, read the Bible and help you to see the ‘big picture’ concerning what’s important in your life. Ephesians 4:16 NCV talks about operating as a body: ‘All the parts of the body are joined and held together. Each part does its own work to help the whole body grow and be strong with love.’ Don’t try to do it alone. Reach out to friends who’ll reach back. What an amazing privilege we have to enter boldly into His throne of grace. We serve a personal God who desires a relationship with us. We have access to Him 24 hours a day, 7 days a week, 365 days a year! But notice that today’s verse tells us that we shouldn’t just come to Him any old way. We shouldn’t come empty-handed to the King of kings and the Lord of lords. What do we have to give that’s worthy of Almighty God? Our praise. Our thanksgiving. Our worship. We should always enter His gates with an offering of adoration from our hearts. Praise isn’t just about singing songs on Sunday mornings. Praise is the expression of gratefulness to God for Who He is and all that He has done. Praise gets God’s attention. Praise is a powerful tool in the life of the believer because God inhabits the praises of His people! When we enter His presence the right way, He enters our circumstances; and when God shows up, the enemy must flee! Today, enter into His gates with thanksgiving and open the door for Him to move on your behalf! Because of the cross of Jesus Christ, God is free to righteously bless all who simply believe in Him. The cross frees God to be gracious toward us even when we are undeserving, because Jesus bore the punishment for our sins. The more you believe this and meditate on this truth, the more you put yourself under the grace of God. What happens when you are under God’s grace? The Bible tells us that sin and all its effects will not have dominion in your life when you are under God’s grace. Suppose your doctor has told you that you have a weak heart. Go to God and say, “Father, I bring my heart to You and I put it under Your grace.” Something happens when you do that. The health of your heart no longer depends on what the specialists have said, or how severe the symptoms are. It doesn’t depend on your ability to do this or that. 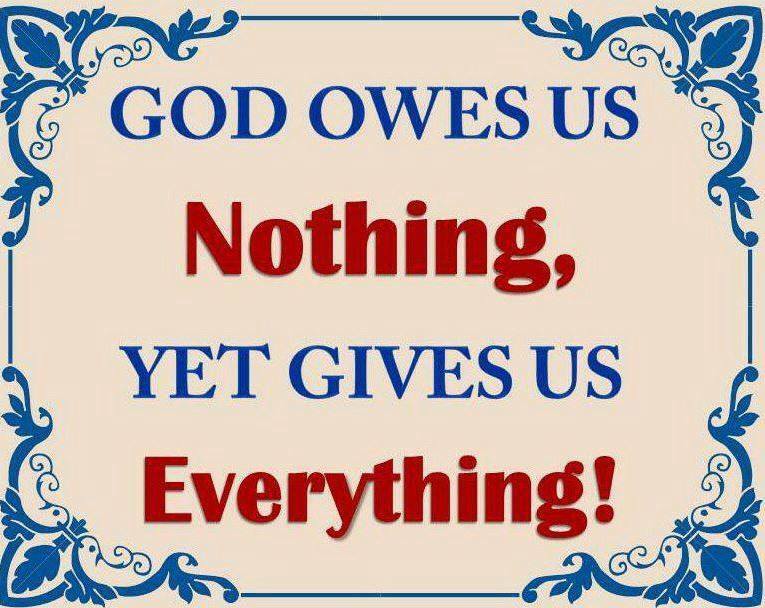 It now depends on God’s unmerited, unearned favor! Beloved, bring each area of your life under God’s grace. One by one, bring them all under the spout of His unmerited favor. The enemy may still give you negative thoughts that cause you to worry about a specific area. If he does that, just remind yourself that that area is under God’s abundant grace! Christ’s kingdom is spiritual, in the hearts of men – not physical; therefore, our fight as Christians must not be with carnal weapons but with spiritual weapons (2 Cor. 10:3-5). Spiritual forces cannot be defeated with human weapons. When we are being attacked for being a part of Christ’s kingdom, we must fight with spiritual weapons. Our warfare is not against people, but against the spiritual powers that operate behind the scenes through people. We must realize who the real enemy is and fight with the spiritual weapons the Lord has given us. We often think that anger will put a person in his place. But “the wrath of man does not work the righteousness of God” (Jas. 1:20). Anger displayed against people puts us right into the hand of the devil. The way to overcome the spiritual powers that come against us through people is to turn the other cheek (Mt. 5:39). That makes the demons flee in terror. One of the main weapons the Apostle Paul speaks of is the Gospel, which is the Sword of the Spirit, (the Word of God). It’s the Word backed by God’s Spirit that can pull down and crush the strongholds of Satan. Every Christian is at war. There is a perpetual struggle against Satan and his kingdom from which there are no “leaves” or “discharges.” Our enemy goes about as a roaring lion, seeking whom he may devour (1 Pet. 5:8). Those who resist the devil will see him flee (Jas. 4:7). The only ones whom he devours are those who don’t actively fight against him. Psalm 150 is not only a beautiful expression of praise, it’s also a lesson in praising the Lord. It tells us where to praise, why we’re to praise, how we’re to praise, and who should offer praise. Where do we praise? In God’s “sanctuary” and “mighty firmament” (v.1). Wherever we are in the world is a proper place to praise the One who created all things. Why do we praise? First, because of what God does. He performs “mighty acts.” Second, because of who God is. The psalmist praised Him for “His excellent greatness” (v.2). The all-powerful Creator is the Sustainer of the universe. How should we praise? Loudly. Softly. Soothingly. Enthusiastically. Rhythmically. Boldly. Unexpectedly. Fearlessly. In other words, we can praise God in many ways and on many occasions (vv.3-5). Who should praise? “Everything that has breath” (v.6). Young and old. Rich and poor. Weak and strong. Every living creature. God’s will is for everyone to whom He gave the breath of life to use that breath to acknowledge His power and greatness. Praise is our enthusiastic expression of gratitude to God for reigning in glory forever. Praise is the overflow of a joyful heart. This entry was posted in WALTER'S WEB and tagged christianity, FAITH, FALSE PROPHETS, FULL GOSPEL, GIFTS OF THE SPIRIT, GIVE THANKS, HOLY SPIRIT, JESUS CHRIST, VICTORY, VICTORY MINISTRIES, WALTER KAMBULOW, WORD OF FAITH on November 27, 2014 by WALTHOPE.